A friend recently found himself in Glasgow via the wonder of an overcomplicated train table and, having arrived at the unintended destination, proceeded to drown his sorrows through the medium of strong lager. The following morning he found himself almost drowning, having fallen asleep face down in a bowl of porridge. With a sore head, a faceful of Ready Brek and an inability to walk in a straight line he staggered out onto Glasgow High Street believing that he would fit in with the locals, only to find the residents similarly attired sprinting down the high street in an attempt to eat, of all people, the lank haired love god, Brad Pitt. Unknown to said friend, Glasgow was one of the main filming locations where a substantial portion of the zombie extravaganza World War Z was filmed back in 2012. Much has been made about the troubled production history of the adaptation of Max Brooks novel and those looking for a film of the book will be disappointed. We’ve already had decently budgeted zombie films but this is arguably the first mega budgeted ($200m+), major studio Summer release of a zombie film. 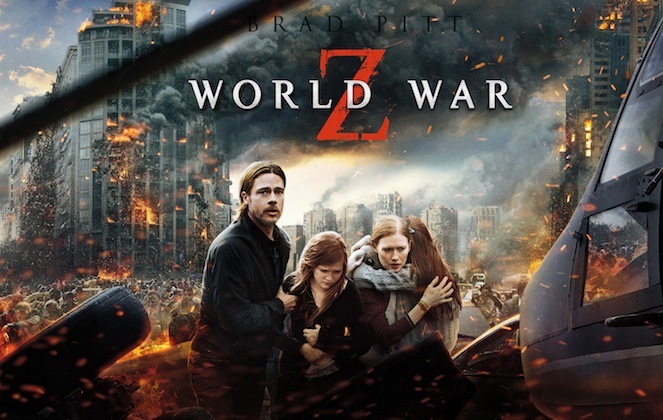 As per the trailer the film opens with Brad Pitt and his family stuck in congestion as the first wave of the undead attack, but managing to escape via helicopter to a battleship – well who hasn’t got a friend we can call who can send a helicopter in times of zombie attack? As a former UN investigator he is pressured into finding the cause of the pandemic and off we go on a jaunt around the world taking in Israel, South Korea and ending in of all places Cardiff, though thankfully the film makers have avoided any Welsh stereotypes. Boyo. Eschewing the novel’s multi strand viewpoint out of necessity for a clearer narrative thread, this is ultimately a series of well staged set pieces centred around the zombies being agitated by sound. Zombie purists will be divided as here they are presented not as glutinous flesh feeders, preferring instead to hurl themselves at you for a bite before rapidly moving onto the next human snack. This has also got a 15 certificate, so those expecting blood letting carnage on a worldwide scale will be disappointed. The book finds the source of the problem in China, but concessions have been made to that particular market. 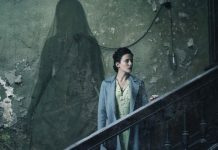 In an effort to recoup the massive production costs the film chooses not to risk offence and relocates its conclusion. Despite the film having had enormous reshoots ( a large section set in Russia was binned and the third act has been rewritten) the film still holds up, though there is no explosive climactic mano-a-mano fight of Brad vs 500million zombies, and it settles instead for a low key though effective set piece. Much has been made of the shuffling vs sprinting zombie and here there is something compelling and frightening about them and the way they run as though Jimmy Savile was competing in a marathon behind them – which is probably why my slow, shoe-shuffling friend stood out. That and the fact that he had a face full of porridge. Since then, my friend checks timetables properly and eats toast for breakfast. All in all this is far from the mess that outraged fans of the novel might allege, though it’s ditched the realities of how governments would deal with such a pandemic. It’s a competently made and at times thrilling popcorn action film bolstered by a soundtrack by Matt Bellamy from pop beat combo Muse.